Team Wellington's Angus Kilkolly celebrates at the final whistle. OFC via Phototek. Team Wellington advanced to the final of the OFC Champions League on away goals after a thrilling 2-2 draw with Auckland City FC in the second leg of their semi-final at Kiwitea Street on Sunday, ending the defending champion’s run of seven straight confederation titles. 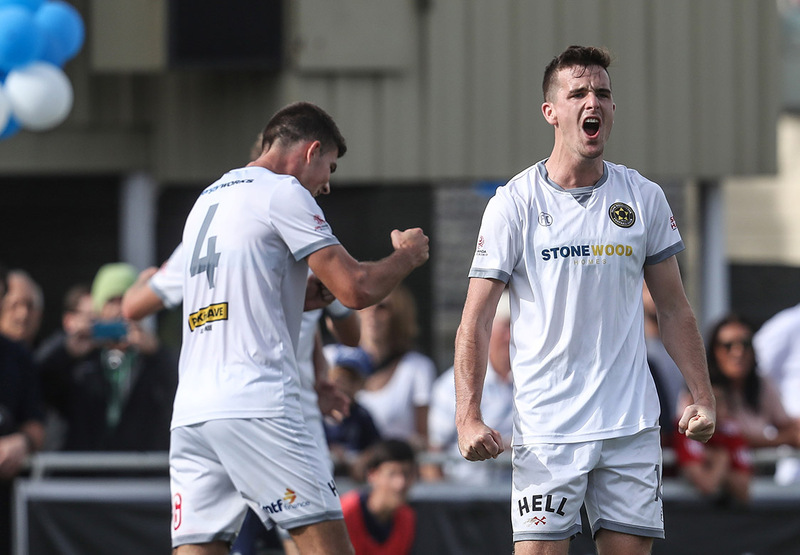 With the teams locked at 0-0 after the first leg in the New Zealand capital last weekend, Eric Molloy and Angus Kilkolly were the goal scoring heroes in the first half for Team Wellington who advance to their fourth straight OFC Champions League final. It will be their first against someone other than Auckland City. They will face the winner of Solomon Islands’ Marist and Fiji’s Lautoka in the two-legged decider played between May 12 and 20. An Emiliano Tade free kick midway through the second half deflected in off the Wellington wall to bring the home side back from the brink after a uncharacteristically lacklustre first half effort. The pressure only built from there and eventually told on the visitors when Scott Hilliar turned a cross into his own net in the seventh minute of what proved to be a frantic 10 minutes of additional time. Auckland continued to press for a winner, even throwing goalkeeper Zubikarai forward for a pair pf late corners but José’s Figueira’s side did what they needed to reach the final whistle without further damage. “The biggest emotion is pride for the players and the team. It’s always going to be difficult coming here and I thought we were exceptional in the first half. We thoroughly deserved our two goals and could’ve had three or four,” said Figueira. Figueira said he warned his side to expect a backlash in the second half from the nine-time Oceania champions but commended his side for being able to dig deep and secure a hard-fought result. After a goalless encounter in the first leg, the return match was a much more open affair with both goalkeepers called on to keep the scores level. Eñaut Zubikarai produced a pair of brilliant double saves to twice deny Nathanael Hailemariam and Eric Molloy but the Auckland City goalkeeper finally had to pick the ball out of his net when Molloy rocketed a header back across him and into the opposite corner of the net in the 37thminute. The goal brought to an end Auckland City’s remarkable record of 1079 minutes without conceding in the OFC Champions League. Cam Howieson brought down Roy Kayara in the box four minutes shy of halftime – on one of the impressive New Caledonian international’s many forays forward from defence – to hand the visitors a chance to double their advantage from the penalty spot. Kilkolly gladly obliged to put his side in command at half time. Auckland City coach managed to inspire his side to far better performance after the break but needing three goals in the second half proved too high a climb. “It was a game of two halves,” Tribulietx said. “In the first half we just didn’t quite get there. We wanted to construct more football from the back and we started well. We started dropping passes and maybe that mentality gave us a little fright because we started getting too deep out of possession. After celebrating the victory, Team Wellington’s eyes turned quickly to Honiara where Marist were hosting Lautoka in the other semi-final later on Sunday. Wellington will host the winner of that semi-final on the weekend of May 12 and 13 and then travel for the return leg a week later.